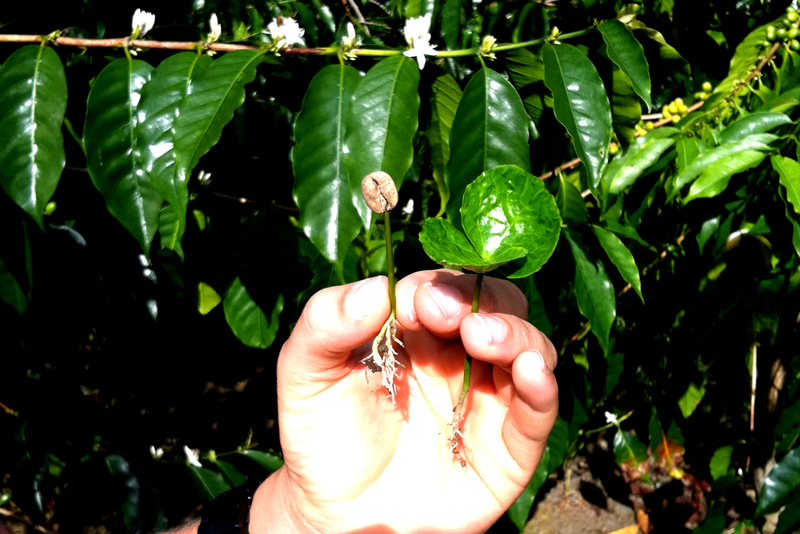 The journey of a Kona Coffee & Tea coffee bean starts as a seed. Once planted in the rich volcanic soil of Hualalai, this sprout is nurtured by the sunny mornings, afternoon clouds, and regular rainfall. 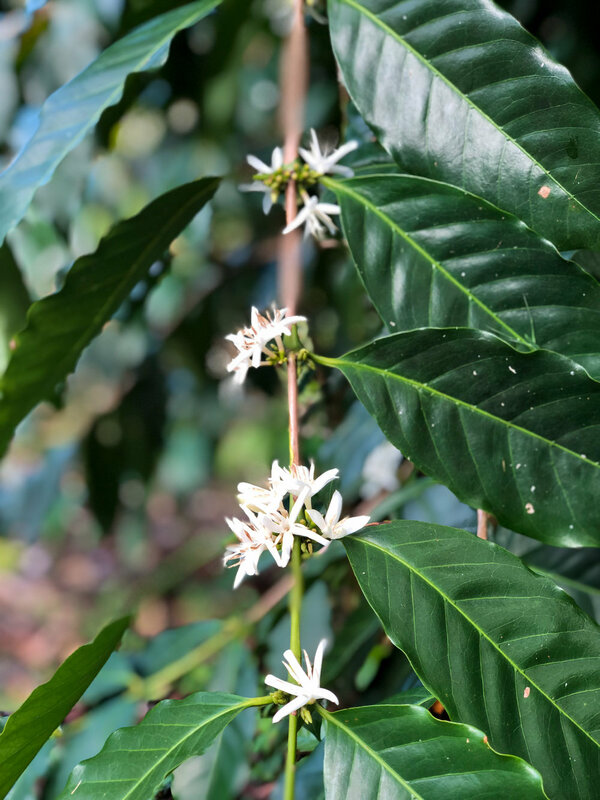 Located on the crown of the “Kona Coffee Belt”, our farm provides ideal growing conditions for the Arabica Typica coffee varietal, at 2,000 ft. above the sandy beaches of Kona. 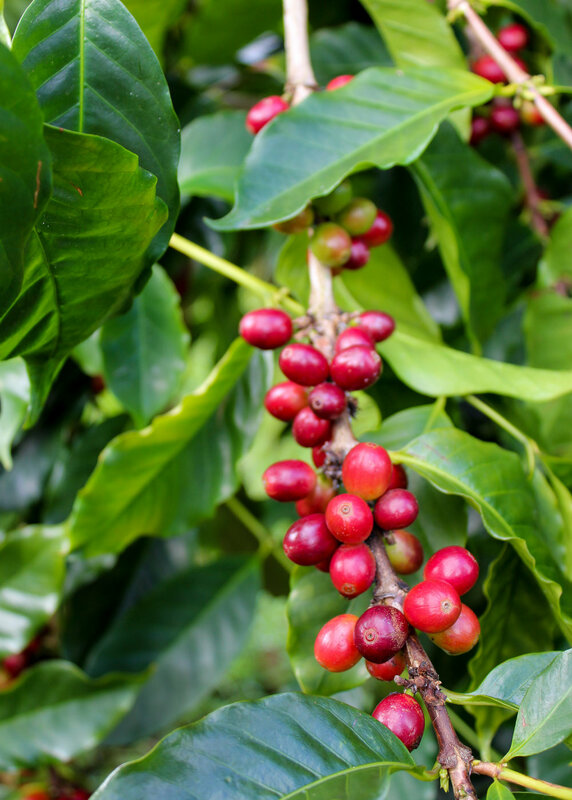 Our coffee is “single-estate”, which means it comes only from our farm where we can trace the origin of every bean. Three years after planting, delicate white flowers emerge between January and May. These sweet-smelling blooms are affectionately known as “Kona snow”. As the “Kona snow” melts away, a bright green cherry develops, holding our precious coffee bean inside. Then once the summer sun ripens the cherry to red, our pickers meticulously look for only the perfect fruit to pick by hand, coming back to the same tree numerous times before the end of a harvest. 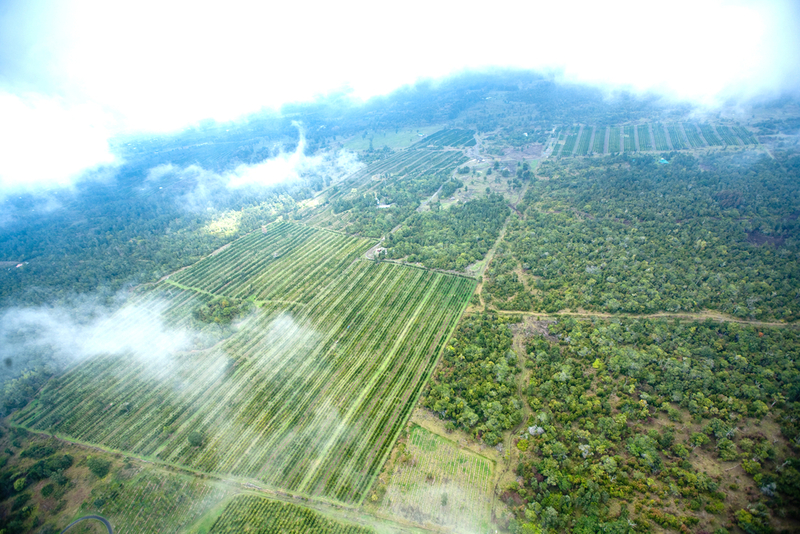 From our fields, the bright coffee cherry travels ten minutes down a windy country road in Holualoa to our mill. The ripe cherry is then hulled, polished, cleaned, and graded by our wet and dry mill. 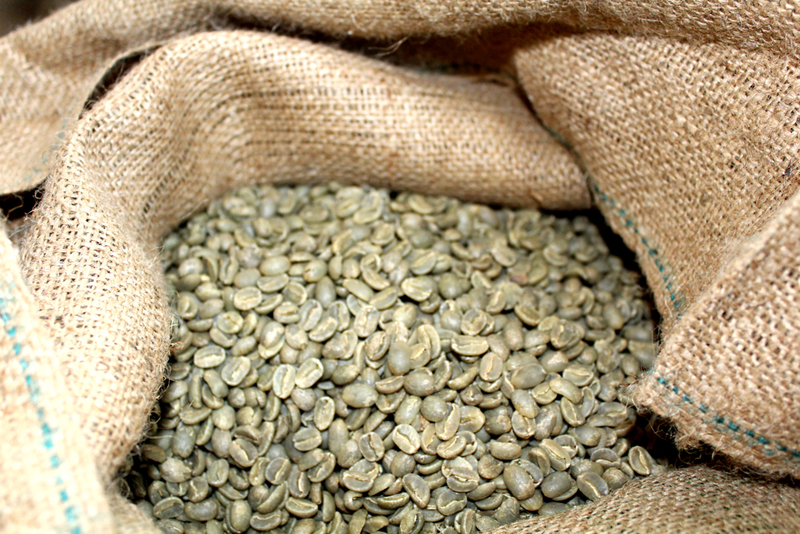 Milled and dried green coffee beans are then roasted at the same facility. In small batches, our Master Roaster expertly transforms the different grades of green beans into the chocolate-hued Kona coffee beans we know and love. While crafting light, medium, full city, or dark roasts, she tests each batch to ensure the perfect taste, smell, and color. This journey ends for our prized coffee bean in a cup of velvety flavor. The roasted Kona Coffee & Tea beans are exclusively brewed and served in our café and are also available for purchase in our online shop. There are very few Kona Coffee farms that grow, mill, and roast their own beans. And even fewer that can say, "From Our Farm to Your Cup". But that's exactly what takes place at The Kona Coffee and Tea Company. Kona Coffee & Tea is family-owned-and-operated by the Bolton family. It was started by Dan and Jan Bolton by planting 20 acres of Kona coffee on old cattle ranch land called Waiono Meadows, located on the Kona Coffee Belt, in Holualoa. Today those first 20 acres have grown to over 200, the coffee has won numerous awards, and is enjoyed by connoisseurs around the world. Their daughter Malia and son Danny now handle the day-to-day operations. See the artistry of our farm-to-cup operation for yourself and enjoy a curated coffee sampling in our coffee fields. Arrive by custom charter helicopter tour, provided by Paradise Helicopters. Gratitude should not be reserved for one day of the year. Gratitude is an integral part of what makes each and every one of us grow and shine. Here at Kona Coffee & Tea, we are overflowing with gratitude. The three amazing souls named below are just a small example of the countless passionate and dedicated family and staff that help to make Kona Coffee & Tea what you see and taste today. In the memory of one lost life, others have been saved. On Tuesday, November 27th, 2018 we will give to The Daniel R. Sayre Memorial Foundation in celebration of #GivingTuesday. The foundation provides essential equipment and training to the Hawaii Island Fire Department who serves the Hawaii community. #GivingTuesday is a global day of giving fueled by the power of social media and collaboration.